Concept of hunting the hidden treasure seems to be quite popular among developers of online slot machines. There's no reason why it shouldn't be, as the concept seems to be favored by players. 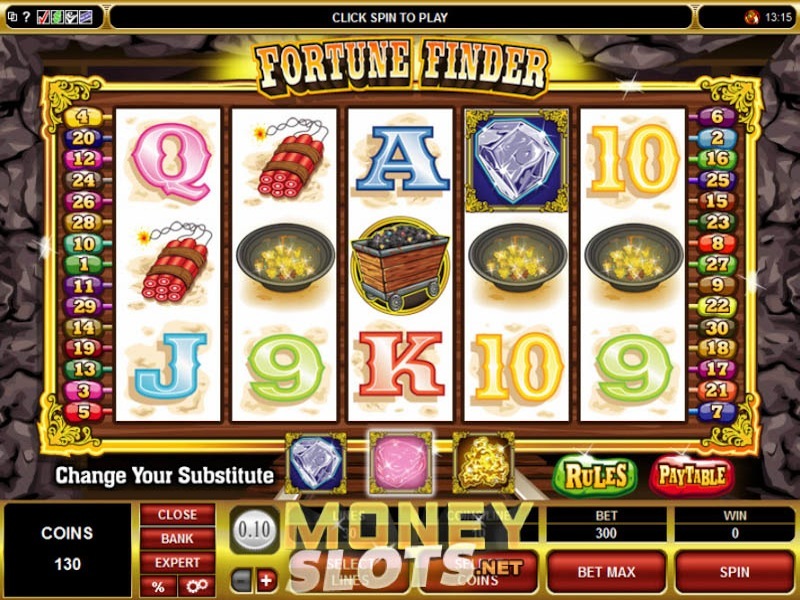 MicroGaming have developed a wide range of games, but Fortune Finder is based on the exact concept outlined above. If you've always dreamed about a chance to go on a treasure hunt, this might be your chance. You'll find 30 pay-lines to play on sorted over 5 reels and a framework that is commonly used for classic slots developed by MicroGaming. However, this game is nothing like the fruit machines. It's seemingly packed with features such as free spins, additional gamble game and a chance to pick your preferred wild symbol. The maximum win in the game is quoted as 6,000 coins that translates to $30,000 when turned in real money figures. However, as all wins are doubled during free spins, there's a chance to win up to $60,000 during these. We already gave a brief mention about the fact that Fortune Finder is based around the same framework as most classic slots from MicroGaming. This is actually a great thing due to the fact that it makes this slot machine incredibly easy to play. There only are a couple of buttons in the playing panel between the reels that can be used to change the most important aspects of the game. Before we get into detail about those buttons, make sure to check the paytable and rules of the game. This can be done by clicking on either the ''Rules'' or ''PayTable'' buttons respectively. You'll find all the information needed under these two tabs. Other than that, buttons in the game include + and – allowing you to adjust the coin size to use, when wagering on pay-lines and spins. There also are two ''select'' buttons, for selecting the amount of pay-lines to play on along with the amount of coins to bet. Bet Max button, when pressed, will bet the maximum amount of coins per pay-line and spin the symbols automaticaly. Be aware of this, as a single missclick might be quite costly. Experienced punters can also switch to the so called ''Expert'' mode that offers more buttons, autoplay and adjustments to be made. This is a pretty flexible slot game in terms of the amount that can be wagered per spin. Don't be tricked by this fact, though. Always try to keep cool and be smart about how much money you are putting on a line per spin. There's a pretty simple rule, allowing you to have fun while also improving the chance of qualifying for a payout of significant size. To sum it up, Fortune Finder is a solid game for all player types and is easy to play, while also having a couple of more advanced featured implemented. Top fixed jackpot of $30,000 adds the thrill to turn it from an okay game to play, into a great one.